Milton Friedman explains the role of gold in the Great Depression. Note: I absolutely DON'T agree with the theory of Keynes (an British government bureaucrat in those days) nor the theory of Milton Friedman but the video clip is reasonably good. Therefore the video clip should be looked at only out of a historic point of view. Few people that actually experienced the great depression are still alive. Only months ago, I talked to a lovely old lady running an antique shop in Vero Beach, Florida. She remembers it all to well and she knows better. She explained to me that often she and her daughter had arguments about the way people are living today and she feels sad because her daughter doesn’t seem to understand nor wants to admit what is about to happen. It is a pity that today's youth but also the generation that was born after the Great Depression like the baby boomers are still in a stadium of denial. The situation makes me think of Galbraith's book: "The age of uncertainty" where the writer describes the three generation cycles . The US economy had experienced rapid economic growth and financial excess in the late 1920s, and initially the economic downturn was seen as simply part of the boom-bust-boom cycle. Unexpectedly, however, output continued to fall for three and a half years, by which time half of the population was in desperate circumstances (map1). It also became clear that there had been serious over-production in agriculture, leading to falling prices and a rising debt among farmers. At the same time there was a major banking crisis, including the "Wall Street Crash" in October 1929. The situation was aggravated by serious policy mistakes of the Federal Reserve Board, which led to a fall in money supply and further contraction of the economy. Agricultural marketing act: The Act was not beneficial; as the inflation ran deeper than the value of the money, the real value of the half a billion dollar fund started sinking and the losses of the farmers were getting bigger and bigger. (15 June 1929) This law created an eight-member federal farm board. The board promoted organization of agricultural cooperatives that could stabilize farm prices. The cooperatives could win voluntary agreement from farmers to reduce commodity surpluses by reducing land under cultivation, or they could purchase large amounts of commodities and hold them from sale until market prices rose. The sum of $500,000,000 was appropriated to loan to cooperatives for such purposes. In 1930 the Federal Farm Board set up its own marketing cooperatives to buy and hold cotton, grains, and wool. By 1931 the US was holding large amounts of these commodities, which could not be sold without large losses, but had failed to halt the steady decline in crop prices because it could not prevent overproduction by the majority of farmers, since the act's crop-limitation programs were entirely voluntary. You ain't seen nothing yet". Born in 1922 I remember the `Great Depression` vividly. It has shaped my entire life. I lived in a small local shop located about one mile from a large shipyard. 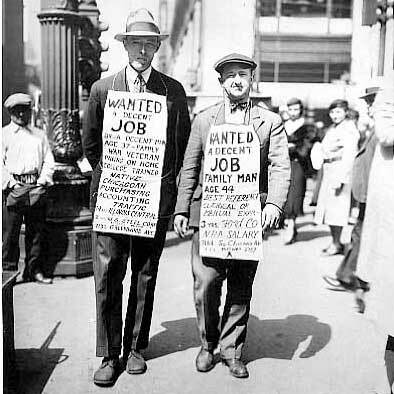 In 1929 everyone was unemployed without any cash or sustenance. However no-one had personal debt. There were no robberies because no-one had anything worth stealing, That depression lasted until 1937 when rearmament became necessary. Apart from our first house purchased in 1950 I have never had any loans or personal debt. Today I see similarities except that most people have huge personal debt I hate being a pessimist but can visualize the coming depression to last for many years or cumulating into WW3. I just hope that my predictions are incorrect. I was born in a depression and guess that I am to die in a depression. Sad! I could write so much about this subject but will spare readers such doom and gloom.